Trailer-park teenager Lance Guest regularly escapes from his humdrum existence by playing the video game Starfighter. His expertise at this recreational endeavor attracts the attention of affable stranger Robert Preston. Before he knows what's happening, Guest is whisked by Preston into the outer reaches of the galaxy! It turns out that the Starfighter game is being played in deadly earnest in outer space, and that Guest is expected to join Preston's Star League, then do battle with the wicked Kodan forces. Guest's principal ally is the lizardlike Grig (Dan O'Herlihy--and we didn't recognize him either). His great rival is the traitorous Xur (Norman Snow). The contrast between Guest's earthbound life as the son of single-mother Barbara Bosson and his new position as Starfighter is daunting at first, but soon the boy is manning a spacecraft and zapping the baddies as though he's been doing it all his life. 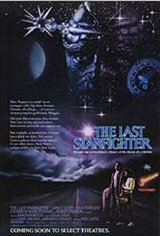 The Last Starfighter was clearly designed with sequel in mind: giveaways include the resurrection of a dead character and the surprisingly casual escape of the villain. While the film didn't stir up enough business to warrant a sequel, the Starfighter video game remained a much-sought-after commodity by joystick-happy warriors all over the country.